I'm proud to introduce to you the coolest new product I've come across lately: Name Your Tune CDs! 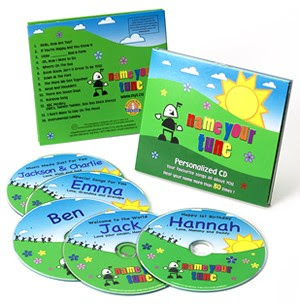 These CDs are made-to-order especially for each customer and come with 14 personalized songs with your child's name right in them! In fact, your child will hear his or her name over 80 times while listening to their special songs! You'll hear such songs as "Little __ Had a Farm", If You're Happy And You Know It, and Boom, Boom Ain't It Great To Be YOU! (For the complete playlist and to hear each song, click here). Name Your Tune graciously sent me a personalized CD for my own two boys and they were SO excited to hear their names! I watched them both as their eyes lit up when they recognized that the song was all about them...it was priceless. Even the label itself can be personalized with a special message for your child. Mine reads, "Special Songs for Josh and Austin... Love, Mommy and Daddy". There are over 4000 names available and the list is constantly being updated. In fact, they are headed into the studio next week to record even more names! Not only is the product impressive but the people behind it are amazing, too. They have decided to donate a portion of their sales to Hear Here, a non-profit charitable foundation that purchases hearing aids for children. In addition, their packaging is also fully recycled and fully recyclable. Name Your Tune has been featured on The Today Show and is a favorite product of many celebrities! They also offer other personalized items such as lunchboxes, placemats, wall art and paintings...the list goes on and on and the possibilities are endless! It goes without saying that these would make great Christmas gifts and they will be ready in time for the holidays as long as you order by December 19th. My little niece is a drama queen and I KNOW she'd love the mention of her own name in a CD, so I've ordered one for her for Christmas. What's awesome is that just for being a reader of my blog (thank you!) you can get a special discount on your order. Just go to Name Your Tune's website and enter the code "oneday" when you order to save $5 off your purchase! 6.) Tell me how you found my website. 7.) Head over to Name Your Tune's website and tell me one other product you like. Giveaway will end Friday, November 6th at 10 p.m. EST. Winner will be selected at random and will be contacted via e-mail (so make sure that I have yours)! Good luck! I would get a cd for Ryan because he loves music. I would make my daughter a CD for Christmas! I found your website originally as a link from a giveaway website. I would make one for my son, Clay! I would make one for one of my grandkids. I would get one for Dylan, my neighbor's little boy, he would love it! If I won, I'd have a CD made for a child of one of my friends. I would love to win for my youngest son, Evan. I found your site thru "Mom Saves Money". I checked out their site and also like the personalized lunchboxes and wall prints. I would make this for my daughter if I won. I'd make it for our best friends two children . We purchased one awhile back, and our toddler LOVES it, and so do we. it would either be for jackson or preston ... one of my boys! thanks for the giveaway! I would make this CD for my granddaughter. Wow that would be so special! I saw this giveaway at my Google Reader. I would make one for my son. He would LOVE this! My kindergartner would love this. He gets so excited about anything that has his name on it. I would make it for Hayden, my nephew! Thanks for the giveaway! 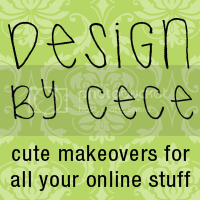 I found this giveaway listed on Helping Mommy's Win blog. I would make this for my 2 kids - Duncan and Danica. I also love their personalized step stools. I would like one for my daughter Hunter!! I found your blog via Helping Mommys Win's blog. I'd like to make a CD for my son, Timothy! I'd make the cd for my daughter. I would get this for my neice Alyzza, nothing comes store-bought with her name on it, poor kid. I found your website via Sweeties Sweeps. I also like the Personalized Wall Art. I'd make it for my son! I'd make it for my new nephew "Linus". It will probably be hard for his parents to find many things personalized with his name. I LIKE THE PERSONALIZED LUNCH BOXES. I would have one made for my daughter, Brianne. Thanks! I would make this for my son Destin. It is impossible to find anything with his name because it is not common. I would make a cd for my daughter Alexandra! She would LOVE this!!! for my little one, Robbie Roo! I'd like to make this for my son, Chris. I would win the cd for my 9 month old daughter, Sienna. i would do this for my son brandon. I would get a Name You Tune CD for my 2 year old grandson. He loves listening to music. Wow, I know I found your blog through a link from another blog, but I can't remember which one!! I like the Personalized Wall Art at Name Your Tune. My grandkids just moved to a new house so the wall art would be a good idea to make their new rooms really seem like home. I would get use this for my 9-month-old daughter who is really beginning to get into the sound of her own name. I would make a CD for my friend. I found your website from another website. I love the Personalized Baby Sheep Blanket!